Venture Corp's 3Q18 PATMI of SGD80.8m (-27.5% y-o-y, -17.3% q-o-q) was below our and street estimates. Management blamed this on transitory factors (i.e., customer disruptions from M&A and new product platforms) and expects a recovery to begin in 4Q18. Furthermore, Venture Corp may benefit from customers relocating production from China to its facilities in ASEAN beginning 1Q19 to avoid US tariffs. Still, we cut FY18-20E EPS by 10-23%, reflecting our tempered revenue growth expectations amid an uncertain macro environment. Our ROE-g/COE-g based Target Price is cut 14% to SGD22.23 now based on 2.5x FY19E P/B from 3.1x FY18E previously. Venture Corp emphasises these are transitory and expects a recovery beginning in 4Q18. Based on customer feedback and POs received, Venture Corp is optimistic the recovery momentum will continue from 4Q18 into FY19. While inventory levels have risen 13% y-o-y and 9% q-o-q, management indicates these are mainly to facilitate a sales recovery and uninterrupted production. Despite the 27% fall in sales, net margin stayed constant y-o-y at 10.5%. We believe this was aided by a positive shift in product mix, evidenced by a ~3ppt y-o-y improvement in gross margin to 26.8%. Cost control was also noteworthy, reflected by a 12.5% y-o-y drop in employee costs. Presently, less than 1-2% of products at Venture Corp’s Chinese factories are impacted by tariffs. Customers are planning to transition production from their Chinese facilities to those of Venture Corp in Singapore and Malaysia, which could begin as soon as 1Q19. 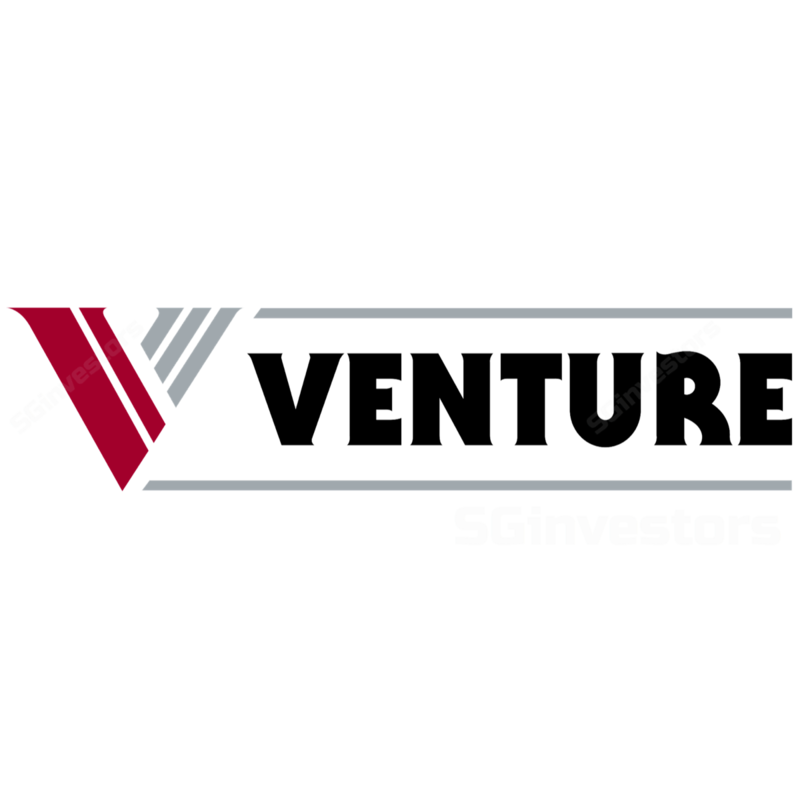 Venture Corp believes that if the trade war does not escalate further and precipitate a global slowdown, it will be in a good position to capture business from customers keen on relocating production to where its plants are located. While management expects growth from new product introductions and wallet share gains as a result of the trade war to contribute favourably in coming quarters, we have opted to cut FY18-20E EPS by 10-23%, reflecting our tempered expectations for revenue growth amid an uncertain environment. We have rolled-forward valuation, and our ROE-g/COE-g Target Price is now based on 2.5x FY19E P/B, based on FY19-21E average ROE of 14.8% and LTG of 2%. 9M18 PATMI fell short of ours and consensus estimates, making up 67% of our FY18 forecast. Historically, 9M18 has typically made up around 70% of full year net profit. a fall in sales from customers that sell point-of-sales systems. Management alluded that 3Q18 was a perfect storm of transitory factors, and expects a firm recovery beginning in 4Q18. They appear optimistic of prospects that the momentum of recovery could last into 2019. Out of seven technological domains, two had experienced decline, two were flat, and three experienced some growth on a y-o-y basis. Management expects all seven domains to register q-o-q growth in 4Q18. They commented that elevated inventory levels (+13% y-o-y, +9% q-o-q) was due to the stocking of passive components (e.g. MLCCs) that are currently experiencing global supply shortage, as well as raw materials and WIP inventories in preparation for product ramp-ups in subsequent quarters. Venture Corp’s observations of customers’ pre-launch marketing and promotional activities. creditable cost control (employee costs fell 12.5%). This was the fifth consecutive quarter that Venture Corp’s margin is above the 9% threshold. 9M18 R&D expense surged 155%, spurred by increased customer requirements. Increased design and R&D content could bode well for Venture Corp’s pricing trends looking ahead. Venture Corp stated that only 1-2% of its production in China has been impacted by the US-China trade war. If the trade war does not escalate further and precipitate a global slowdown, management is optimistic that VMS will be a net beneficiary of current tensions due to Venture Corp’s extensive production footprint in South East Asia. Some customers plan to transition production from their own Chinese factories into Venture Corp’s factories in Malaysia and Singapore. Management expects this to positively accrue to the company beginning 1Q19.